As an impact of the great counterfeiting of truths, and spending millions dollars by Syrian regime on huge media organizations ,at first glance it appeared that the armed groups that came to Syria after the revolution turned into armed conflict, that these are the real enemies of Christian, and they shell and destroy churches, but when we have neutral, objective research, we found it’s quiet different, and the most important evidence is the conclusion of this report, where Syrian regime targeted 33 churches, and use many of them as military barracks and headquarters to shell the neighboring areas, after he expelled the resident and prevented prayers there, while armed groups targeted two churches. Syrian regime practiced demagogue depends on lies and counterfeiting and convince Syrian and the world that the aim of the revolution is not to eliminate tyranny and corruption, and to achieve democracy and social justice , but it is sectarian conflict between ethnic components of the Syrian society. But the clear fact that killing ,shelling and destruction carried out by the Syrian regime does not differentiate between a sect and other, they shelled mosques and churches, Scud missile, artillery ,tanks or snipers didn’t recognize among Muslim, Christian or otherwise. 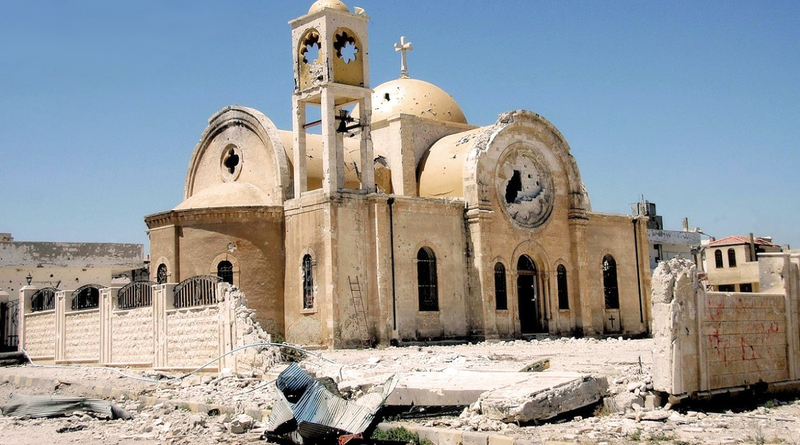 Many churches, mosques and building have been destroyed before 15/7/2013, that’s mean even before the conflict turned into non-international armed conflict, where Syrian regime is only possess heavy equipments.